Download "and, upon voter approval, issue general obligation bonds. They may also issue revenue bonds upon approval by the state board of education." 2 property tax levied by the member school districts. The member school districts my also issue bonds on behalf of the college. For census statistics, a branch community college is classified as a dependent activity of the parent state university or college and is not counted as a separate government. No branch community college districts may be created after January 1998 unless specifically created by the state legislature. Learning center districts may be created in a school district or community college district upon adoption of a resolution by the local school board or community college board, subject to approval by the commission on higher education. The board members that create the learning center district also serve on the board of the district. The board may levy a property tax. Learning center districts are extensions of educational institutions and are not counted as separate governments for census purposes. 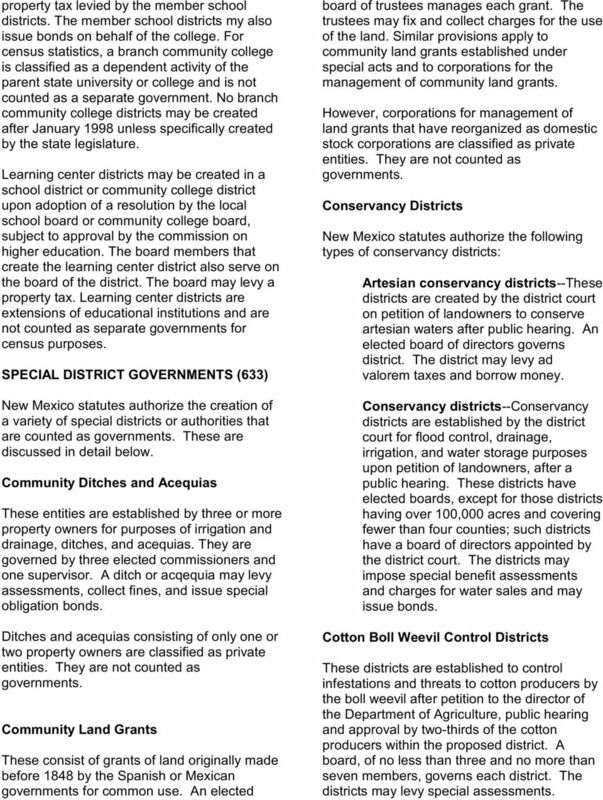 SPECIAL DISTRICT GOVERNMENTS (633) New Mexico statutes authorize the creation of a variety of special districts or authorities that are counted as governments. These are discussed in detail below. Community Ditches and Acequias These entities are established by three or more property owners for purposes of irrigation and drainage, ditches, and acequias. They are governed by three elected commissioners and one supervisor. A ditch or acqequia may levy assessments, collect fines, and issue special obligation bonds. Ditches and acequias consisting of only one or two property owners are classified as private entities. They are not counted as governments. Community Land Grants These consist of grants of land originally made before 1848 by the Spanish or Mexican governments for common use. An elected board of trustees manages each grant. The trustees may fix and collect charges for the use of the land. Similar provisions apply to community land grants established under special acts and to corporations for the management of community land grants. However, corporations for management of land grants that have reorganized as domestic stock corporations are classified as private entities. They are not counted as governments. 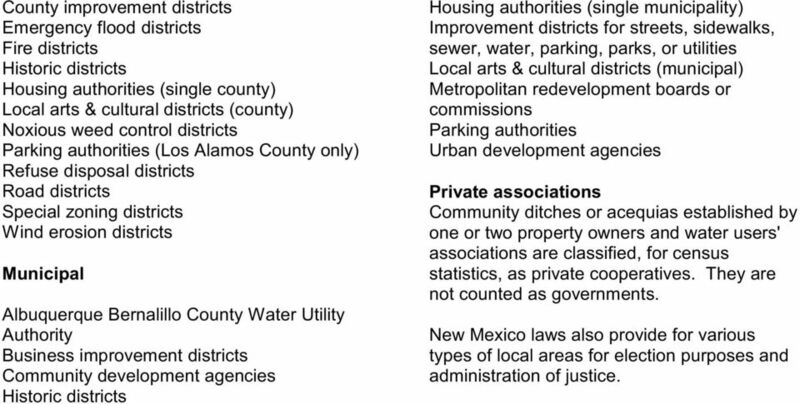 Conservancy Districts New Mexico statutes authorize the following types of conservancy districts: Artesian conservancy districts--these districts are created by the district court on petition of landowners to conserve artesian waters after public hearing. An elected board of directors governs district. The district may levy ad valorem taxes and borrow money. Conservancy districts--conservancy districts are established by the district court for flood control, drainage, irrigation, and water storage purposes upon petition of landowners, after a public hearing. These districts have elected boards, except for those districts having over 100,000 acres and covering fewer than four counties; such districts have a board of directors appointed by the district court. The districts may impose special benefit assessments and charges for water sales and may Cotton Boll Weevil Control Districts These districts are established to control infestations and threats to cotton producers by the boll weevil after petition to the director of the Department of Agriculture, public hearing and approval by two-thirds of the cotton producers within the proposed district. A board, of no less than three and no more than seven members, governs each district. The districts may levy special assessments. 4 of the irrigation districts creating them and are not counted as separate governments. Metropolitan Water Boards These boards are created by joint resolution of a county and a municipality. The district board includes one member appointed by the county, one appointed by the municipal governing body, seven elected by the voters, and, provided certain conditions are met in class B counties, one selected by the principal private water company in the municipality. 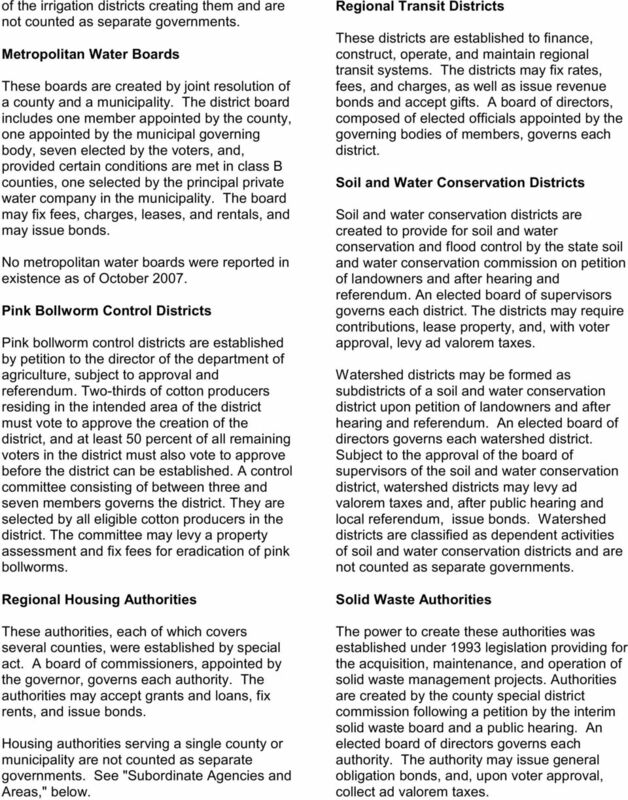 The board may fix fees, charges, leases, and rentals, and may No metropolitan water boards were reported in existence as of October Pink Bollworm Control Districts Pink bollworm control districts are established by petition to the director of the department of agriculture, subject to approval and referendum. Two-thirds of cotton producers residing in the intended area of the district must vote to approve the creation of the district, and at least 50 percent of all remaining voters in the district must also vote to approve before the district can be established. A control committee consisting of between three and seven members governs the district. They are selected by all eligible cotton producers in the district. The committee may levy a property assessment and fix fees for eradication of pink bollworms. Regional Housing Authorities These authorities, each of which covers several counties, were established by special act. A board of commissioners, appointed by the governor, governs each authority. The authorities may accept grants and loans, fix rents, and Housing authorities serving a single county or municipality are not counted as separate governments. See "Subordinate Agencies and Areas," below. Regional Transit Districts These districts are established to finance, construct, operate, and maintain regional transit systems. The districts may fix rates, fees, and charges, as well as issue revenue bonds and accept gifts. A board of directors, composed of elected officials appointed by the governing bodies of members, governs each district. Soil and Water Conservation Districts Soil and water conservation districts are created to provide for soil and water conservation and flood control by the state soil and water conservation commission on petition of landowners and after hearing and referendum. An elected board of supervisors governs each district. The districts may require contributions, lease property, and, with voter approval, levy ad valorem taxes. Watershed districts may be formed as subdistricts of a soil and water conservation district upon petition of landowners and after hearing and referendum. An elected board of directors governs each watershed district. 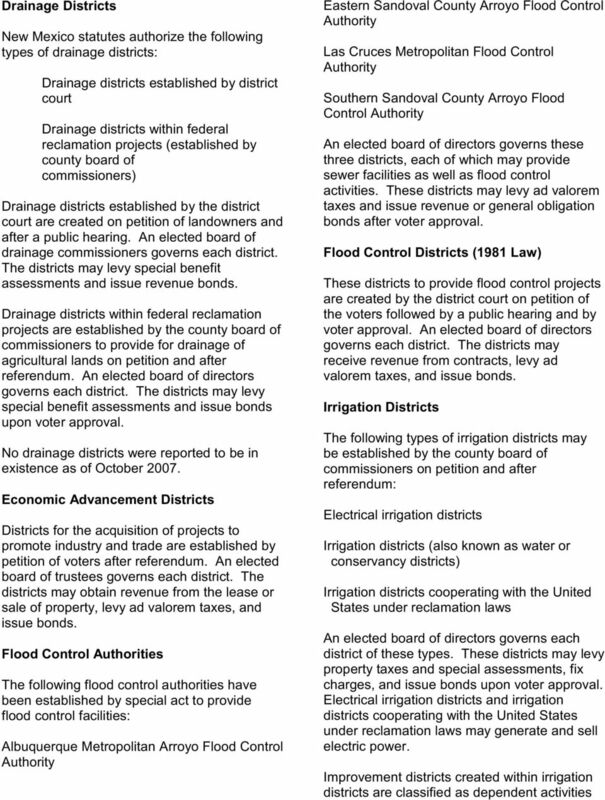 Subject to the approval of the board of supervisors of the soil and water conservation district, watershed districts may levy ad valorem taxes and, after public hearing and local referendum, Watershed districts are classified as dependent activities of soil and water conservation districts and are not counted as separate governments. Solid Waste Authorities The power to create these authorities was established under 1993 legislation providing for the acquisition, maintenance, and operation of solid waste management projects. Authorities are created by the county special district commission following a petition by the interim solid waste board and a public hearing. An elected board of directors governs each authority. The authority may issue general obligation bonds, and, upon voter approval, collect ad valorem taxes. 6 County improvement districts Emergency flood districts Fire districts Historic districts Housing authorities (single county) Local arts & cultural districts (county) Noxious weed control districts Parking authorities (Los Alamos County only) Refuse disposal districts Road districts Special zoning districts Wind erosion districts Municipal Albuquerque Bernalillo County Water Utility Business improvement districts Community development agencies Historic districts Housing authorities (single municipality) Improvement districts for streets, sidewalks, sewer, water, parking, parks, or utilities Local arts & cultural districts (municipal) Metropolitan redevelopment boards or commissions Parking authorities Urban development agencies Private associations Community ditches or acequias established by one or two property owners and water users' associations are classified, for census statistics, as private cooperatives. They are not counted as governments. 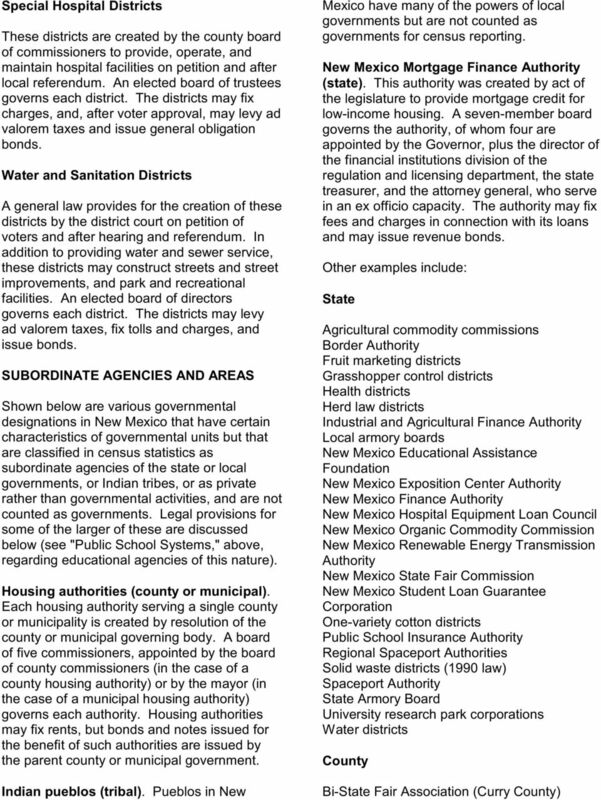 New Mexico laws also provide for various types of local areas for election purposes and administration of justice. NEVADA PUBLIC SCHOOL SYSTEMS (17) Nevada ranks 47th among the states in number of local governments, with 198 as of October 2007. PUBLIC SCHOOL SYSTEMS (1,082) TEXAS. Texas ranks third among the states in number of local governments, with 4,835 as of October 2007. PUBLIC SCHOOL SYSTEMS (180) COLORADO. Colorado ranks 15th among the states in number of local governments, with 2,416 as of October 2007. ALABAMA. City boards of education. Alabama ranks 28th among the states in number of local governments, with 1,185 active as of October 2007. NORTH CAROLINA North Carolina ranks 30th among the states in number of local governments, with 963 as of October 2007. COUNTY GOVERNMENTS (100) There are no areas in North Carolina lacking county government. What Does It Mean To Be A Home Rule Township? New York 1. There is no longer any effective size classification of cities or villages. Land Use Series. Check List # 1I For Adoption of an Amendment to a Plan. December 22, 2010. Bringing Knowledge to Life! Georgia 1 PUBLIC SCHOOL SYSTEMS (180) Georgia ranks 21st among the states in number of local governments, with 1,448 as of June 2002. Does the agricultural district impact taxes? Is the agricultural district part of zoning? Does the agricultural district impact taxes? No. The agricultural districts do not affect your taxes. Agricultural lands may qualify for a tax break through the agricultural value assessments program. Land Use Series. Check List # 1G For Adoption of a Plan in Michigan. December 23, Bringing Knowledge to Life! GFOA NYS UNDERSTANDING THE NEW REAL PROPERTY TAX LEVY CAP. New York State Government Finance Officers' Association, Inc.
UNDERSTANDING THE NEW REAL PROPERTY TAX LEVY CAP (How the Real Property Tax Levy Percentage Cap and the Real Property Tax Rate Differ) It seems everywhere you turn people are talking about the Tax Cap. GENERAL ASSEMBLY OF NORTH CAROLINA SECOND EXTRA SESSION 1996 H 1 HOUSE BILL 36. Short Title: Lincolnton-Lincoln Airport Auth'y.